There has never been a better time to be a start-up in the financial services world. While barriers to entry are still high as the previous article shows, emerging technologies are dramatically reducing the cost of reaching customers, and financial institutions are increasingly interested in tapping into underserved markets. In this context, a variety of financial technology accelerators have emerged, with the aim of increasing the chances of start-up success. Our team surveyed a few of these programs – to see what they are offering, and their potential impact. Canary Wharf has historically been the center of innovation in London’s financial services sector – one of the original “smart cities” in Europe. With the launch of Level39, the Canary Wharf Group, a premier business and shopping district in inner London, is carrying on that tradition, establishing the entire 39th floor of the iconic One Canada Square as an accelerator space that aims to identify the next generation of innovators in financial services. Level39 endeavors to become a space where “innovation gets traction,” according to Eric Van Der Kleij, technology entrepreneur and head of the initiative, in a recent interview. The accelerator space – which officially opened its doors this week – offers an array of unique amenities, including an affordable membership package for early-stage entrepreneurs, and an open-plan kitchen where like-minded professionals can mingle and discuss their innovations over coffee. Level39 “sandboxes” offer comfortable, secure ideation spaces where small companies or larger financial services providers can retreat, brainstorm and develop the next big FinTech innovation. 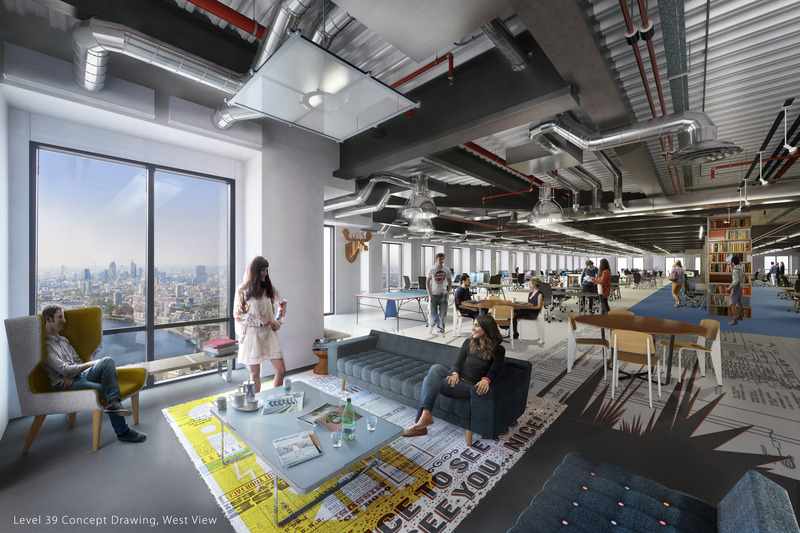 Lounge39, which Van Der Kleij describes as a blend between a business class lounge and a trendy London club, provides a space for investors and financial executives to interact and gain exposure to new innovators in the finance space. These players will be offered reduced-cost lounge membership if they sign up as mentors to Level39 start-ups – encouraging increased involvement in the accelerator from the investor community. Already, the Level39 team has received hundreds of inquiries from companies interested in renting space, and the first cohort of entrepreneurs moved in this week. With such high volumes of interest, how are applicants selected? According to Van Der Kleij, the team looks to identify companies that can genuinely use Level39 resources to slingshot into success, such as ventures that address key pain points in the financial services sector. Occupants will further be chosen based on their unique business concepts and skillsets, creating a complementary ecosystem where start-ups can forge partnerships and learn from each other. In the UK, where 21.6 percent of the GDP comes from financial services, there is a real potential for the country to become a thought leader in financial innovation. In this context, Level39 ultimately aims to be a pioneer in the FinTech space – out of which may emerge the next generation of financial institutions. Start-ups in the financial inclusion space often fall victim to many of the challenges facing other financial ventures, including limited capital and access to investors. Further, these enterprises often aim to tailor their products or services to meet the needs of base-of-the-pyramid (BOP) consumers – financial offerings that typically result in lower profit margins and may be seen as risky investments. As a result, these promising ventures often lack a “runway” to experiment with new business models – hindering innovation. The** Accion Venture Lab** was launched in April 2012 to address these challenges, as a US $10 million seed-stage investment initiative that provides capital and technical support to start-ups in the financial inclusion space. Financial support ranges from $100,000 to $300,000 in convertible debt or equity, complemented by management support, access to Accion experts and support in identifying business leads, mentors and investors. The initiative seeks to make approximately 20 investments over the next three years. While participating enterprises all share an interest in expanding financial services to BOP consumers, the initiative is particularly interested in those that leverage emerging technologies such as data analytics, mobile phones, web portals, or social media. Geographically, the Lab has focused primarily on East Africa and South Asia, but plans to expand into other regions as well. The center of the US financial sector, New York City, has also emerged as a leader in fostering innovative finance and technology start-ups, with multiple high-profile tech accelerators emerging over the last few years. These include the** FinTech Innovation Lab**,an annual, 12-week incubator program sponsored by Accenture and the New York City Fund, which began in 2010. The Lab accepts six innovative companies in the FinTech sphere each year, offering direct access to top executives in leading financial services companies, and a series of workshops, discussions and meetings intended to help participants fine-tune and develop their offerings. In December, the Lab co-sponsored NYC’s first FinTech Startup Weekend, bringing together innovators and executives to discuss challenges and possibilities in the financial space. New York-based Women Innovate Mobile further fosters technology innovation, but with a specific focus on women-founded companies leveraging mobile technology. The initiative aims to address a recurring issue in the technology space: the lack of women-founded companies. Of start-ups nurtured by the well-known Y Combinator accelerator in Silicon Valley, for instance, only 4 percent had female founders. Further, women account for only 6 percent of the chief executives of the top 100 technology companies in the US, and just 17 percent of technology professionals in the UK.